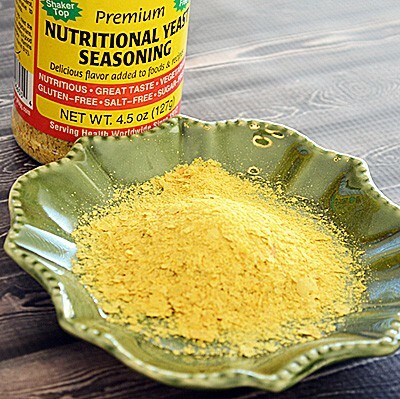 Before I became a vegan, I had never even heard of nutritional yeast but I kept seeing it pop up time and time again in vegan recipes. So I thought, ok…I’ll give this a try and sought it out at my local Whole Foods Market. And it really is good! While you have to remember that it isn’t actually cheese, it sure does offer an undeniable cheesy flavor. You’ll find it in many of my recipes here on The Veg Life! At about 20 calories per Tablespoon, this versatile nutritional additive (with its abovementioned “cheese-like” flavor) has a plethora of culinary applications. It can be sprinkled on most foods such as salads, vegetables, mashed potatos, rice, pasta, polenta and even popcorn! Add it to soups, gravies, sauces, dips and spreads for added flavor and nutrition…the possibilities are endless. And if that wasn’t enough, most nutritional yeast provides fortified essential B Vitamins (including Vitamin B12), which is recommended as supplemention to any vegan diet. 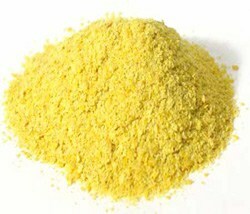 Fortified nutritional yeast adds 150 percent of vitamin B12 and 720 percent of riboflavin. It is also a source of selenium and potassium. While fortified and unfortified nutritional yeast both provide iron, the fortified yeast provides 20 percent of the recommended daily value, while unfortified yeast provides only 5 percent. It contains no salt or sugar, is cholesterol-free and completely vegan. 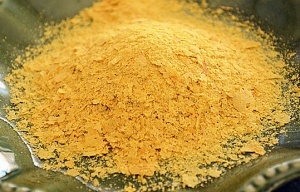 By definition, nutritional yeast is deactivated yeast derived from a single-celled organism, Saccharomyces Cerevisiae, which is grown under carefully controlled conditions on sugar cane or beet molasses for several days, harvested, washed, and dried with heat to kill (i.e. “deactivate” it). Because it is inactive, it doesn’t froth or grow like baking yeast does, and it has no leavening ability. And while we’re at it, let’s cover what it is NOT. It is not brewer’s yeast, active dry yeast or baking yeast and as such, cannot be substituted for any of these. WHAT DOES IT TASTE LIKE and HOW IS IT USED IN VEGAN COOKING? 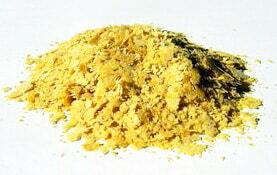 Nutritional yeast has been described as having a strong “nutty”, “cheesy”, or “creamy” flavor, which makes it an ideal vegan option as an ingredient in cheese substitutes. It can be used in many recipes in place of cheese, such as mashed or fried potatos, put into scrambled tofu as a substitute for scrambled eggs. And did I mention it can even top your popcorn? WHO MAKES IT and WHERE CAN I BUY IT? There are several popular brands out there. I like Bragg’s powdered Premium Nutritional Yeast Seasoning. Theirs is Kosher Certified and made with Non-GMO ingredients. It also comes in a nifty shaker top container making it even easier to add to your favorite foods. Other brands I’ve used frequently are Bob’s Red Mill (huge fan of Bob’s Red Mill products) and Red Star, just to name a few. Depending on the brand, it comes available in both a flake form and also a powder. 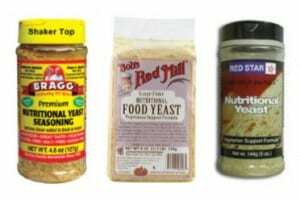 You likely won’t find nutritional yeast in your typical grocery store however some larger chains may carry the Bob’s Red Mill variety in the baking section. Theirs is packaged in a small bag. You might also find it in bulk foods section. You will readily locate it in any natural or organic food store (think Whole Foods, Sprouts, Trader Joe’s, etc.). I’ve heard that GNC and Vitamin Shoppe also carry it. If all else fails, you can find it right here on Amazon.com and shop from the comfort of your own home. Gotta love the Internet!